Visit Web Cube at Shop.org 2013! 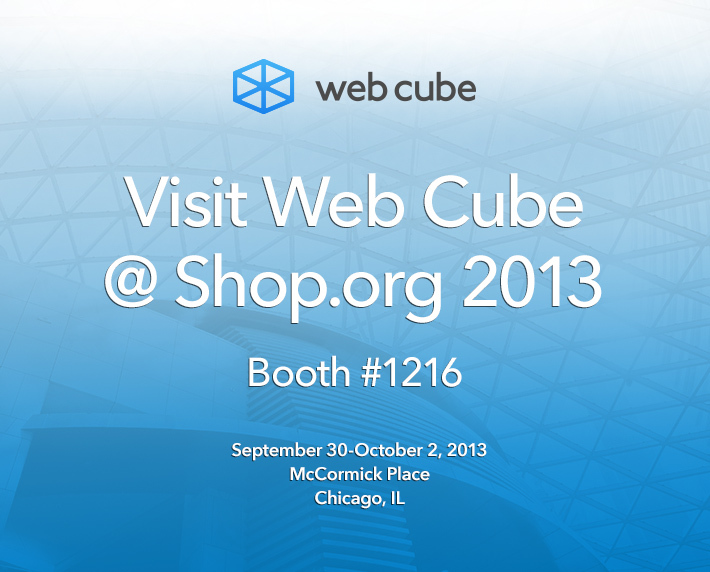 We are excited to announce that Web Cube will be exhibiting at Shop.org Annual Summit 2013 in Chicago, IL! Held September 30th – October 2nd at McCormick Place, the Shop.org Annual Summit is an event where over 5,000 digital and multichannel retailers come together to build relationships, discuss best practices and plan for the future of online retail. Web Cube is honored to join the Shop.org EXPO Hall to showcase the latest version of our completely responsive, all-in-one CMS and eCommerce platform. Be sure to visit us at Booth #1216 for exclusive access to Web Cube demos as well as a chance to win a giveaway from some of our favorite customers including Manduka and Royal Hawaiian. We are also thrilled to have been asked to host a roundtable discussion with top yoga brand Manduka. Be sure to join us on October 2nd at 12pm at Table #3 in the EXPO Hall as we discuss the elements necessary to build intuitive, dynamic and engaging retail experiences for customers online. Contact us today to schedule a meeting with the Web Cube team at Booth #1216. We can’t wait to see you there!